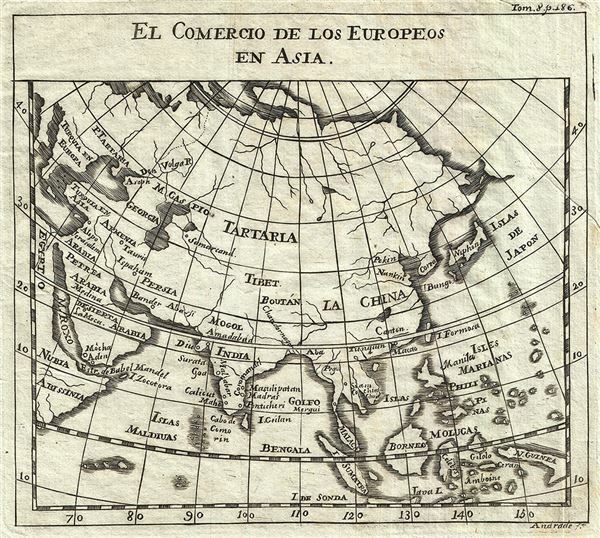 El Comercio de los Europeos en Asia. This is an appealing 1754 map of Asia by Gabriel Ramirez. It focuses on the trade of the Europeans in Asia and depicts Asia as it was understood in the middle of the 18th century, from Egypt east as far as New Guinea. Important cities and trading ports including Goa, Samarkand, Jerusalem, and countries are identified, with limited detail inland. Major rivers are also noted, though most are speculative. This map was originally prepared in French by Abbot M. Pluche and translated into Castilian Spanish. Engraved by Jose Andrade for publication in Volume VII, Part 4 of D. Gabriel Ramirez's Espectaculo de la Naturaleza, O Conversaciones a Cerca de Las Particularidades de la Historia Natural.